Glock pistols are by far the most popular brand of a handgun in the world and one of the most popular sidearms in America. Glock is a weapon of choice among a lot of civilian handgun owners, as well as many law enforcement agencies. Initially designed for the Austrian Government in 1981, the Glock sidearms first took the military and law-enforcement world by storm and then blew away the civilian market. Led by an ingenious engineer, Austrian, Gaston Glock, the company has released over the time 55 different handgun models. Are All Glocks the Same? 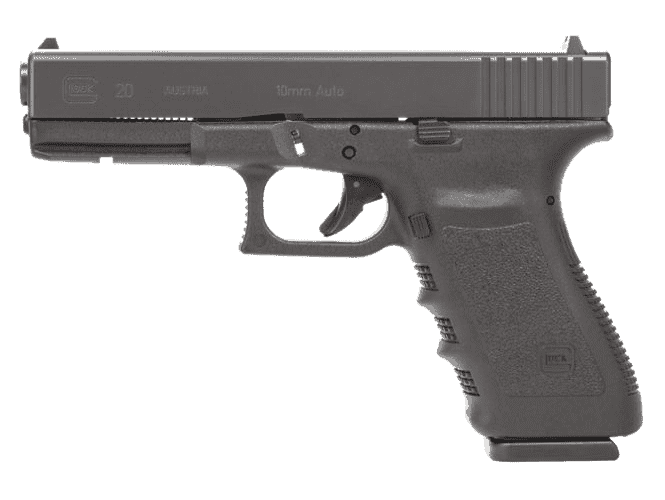 The Glock was the founding father of the new polymer frame concept of handguns with a blocky look and plastic feeling. At first glance, an untrained eye will say that all Glock models are the same and that choosing one is a simple thing. Indeed, the Glock pistols may look similar as they share a number of features and parts are interchangeable between specific Glock models, but most of these cynical or less knowledgeable comments are wrong because of the sheer number of different Glock pistols being produced to compete in the handgun market in every niche. Offering several dozen models, from unobtrusive concealed carry pistols to powerful semiautomatics, you can choose from any number of Glocks as per your interest and needs. While various Glock pistols may come in seven different calibers, compact or full-size, thick or thin, all of them are polymer-framed, striker-fired guns running on a similar system. In addition, Glock models are getting upgraded every so often with revised features, so we now have five generations of Glock handguns. For example, depending on your need or your hand size, you can choose Glock with a double-stack or single-stack magazine since it would make a big difference in “shootability” and carry comfort. The other way to get a trigger distance that works well for your hand size is to opt for the Gen 4 guns with swappable backstraps that optimize the trigger reach. There is a Glock for every situation and it is hard to go wrong with it, but picking the best "Combat Tupperware" model can be hard, especially if you haven't decided what specific purpose you'll be using it for. ​When you have decided how you want to use your new Glock, the size of the gun is the first consideration that will narrow your selection considerably. All Glocks look and operate the same, but they come in five frame sizes. For home defense, the most suitable are Glocks with standard frames and large magazine capacities intended for law enforcement and military use. For concealed carry and home defense, you can use dual-purpose compact frame models, but for deep concealment, the best choice will be subcompacts and the slimline models that come with an extremely narrow frame and a single stack magazine. Finally, if you purchase Glock mostly for fun and casual plinking with friends at the range, you can opt for competition or long slide models. They have longer slides, longer barrel lengths, and better sights making them easier to shoot accurately than a shorter gun. ​Since the Glock pistols are chambered in seven different cartridges, you can use one general rule to narrow down your selection further. As common sense suggests, larger calibers such as 40 S&W, 10mm Auto, .45 ACP, and .45 GAP are more controllable in larger guns, whereas the smaller rounds like 9mm Luger or .380 ACP are most comfortable to control in compacts, making them particularly suitable for concealed carry handguns. One more thing that you have to decide before you buy a Glock is whether to purchase a new or used one. A Glock is built like a tank, so you can buy a pre-owned Glock without overly worrying about gun`s operational defectiveness or attenuation of performances. While the success of Glock pistols is primarily due to the simplicity, durability, and reliability, the company has constantly updated their design by incorporating new solutions and enhanced features. As Glock models are similar to each other, they are also intended for various applications, scenarios, and different people and their level of training. Since context is king, and Glock has a gun for everyone, several reviewed models in the next chapter will serve as examples of what to look for. The Glock 17 is the first Glock wonder pistol that started a polymer frame revolution in handgun design. One of the most popular Glock models, the G17 belongs to the full-sized sidearm category intended for police and military duty, but it is also a perfect gun for home defense and a decent choice for competition. Like all other “Plastic Fantastic” models, Glock 17`s polymer plastic frame comes with four steel rails to function as guides for the metal reciprocating parts, giving it a light, but strong, structure. The Glock 17 is a short, recoil-operated, locked-breech semi-automatic handgun that comes with a 9mm Luger, high-capacity, and 17-rounds magazine. This striker-fired pistol comes without manual safety devices because it relies on an internal safety mechanism that keeps the weapon safe between shots. There is a trigger safety bar which protrudes from the trigger face and is automatically pressed in when taking pressure on the trigger. Currently, the Glock 17 (G17) is available in 3rd, 4th, and 5th Generation models and we'll present the 4th Generation of this full-size handgun, dubbed as Glock 17 G4 FS 9mm Night Sight with manufacturer` number PG1750733FS. The Glock 17 Gen4 is an updated iteration of standard G17 since it offers integral under-frame accessory rail, three interchangeable backstraps, self-illuminating Tritium night sights, and a rough texture grip. However, the first, most visible detail of the G17 Gen4 FS are the front serrations as an additional tactile surface choice that can be used even with a wet or sweaty hand. Hence, there is an FS shortcut in model designations, which stands for "front serration". Unlike its Gen3 predecessors, Gen4 pistols come with an extended reversible magazine release and with a third magazine. With a modular back strap and pronounced "knobby" texturing, the Glock 17 Gen4 is a great model for the average shooter. While the biggest issue with large frame service pistols is concealability, the Glock 17 Gen4 is ideal as a dedicated home defense handgun or as a duty weapon. After the initial success of the Glock 17, there were complaints about its inadequacy for concealed carry, especially by civilians. Gaston Glock reacted by launching a reduced-size Glock 17, a mid-sized handgun that falls somewhere between full-size and sub-compact pistols. Often proclaimed as the best Glock model, the Glock 19, like all Glock pistols, is based on the Browning`s barrel locking system and use the same Glock Safe Action. While the 9mm Glock 19 features the same striker-fired design, unlike the G17, it is built for discreet carry with a grip long enough to enable most shooters to get all four fingers on the grip comfortably. While not designed as a service pistol, the G19 is built around the mid-sized frame which allows for fifteen 9mm rounds in the magazine, making it quite an attractive gun for elite military units as their standard sidearm. However, the model PG1950201 comes with the ten-round magazine to comply with restrictions on magazine capacity in some states. Featuring a four-inch barrel, the Glock 19 is smaller and shorter compared to the G17 but is still long enough for defensive ammunition to perform properly. 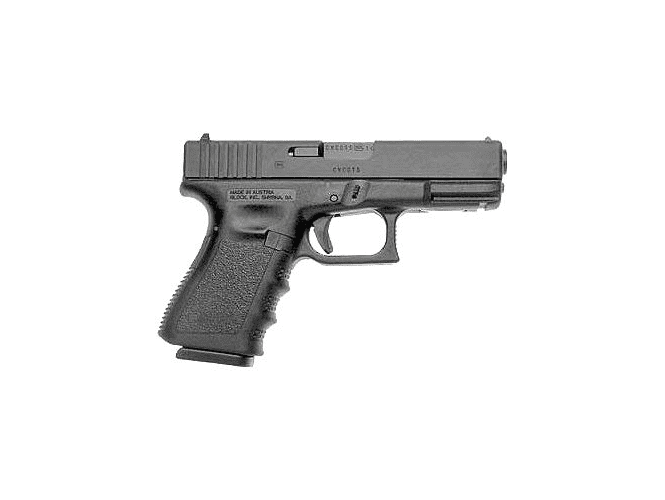 Although it is only two ounces lighter than the larger capacity G17, with a height of 4.99 inches and 1.18 inches wide which make the Glock 19 much more suitable to conceal with the right clothing and carry position. The most versatile model, the Glock 19 performs well in almost every context, but it is not perfect for any particular type of shooting. On the other hand, the combination of magazine capacity, comfort grip, and concealability are nearly impossible to beat. The Glock 19 is an excellent all-around compact gun available in 3rd, 4th, and 5th generation models and is a perfect choice if you're going to buy just one Glock handgun. While many gun experts will agree that a 10mm auto is not for everyone, the Glock successfully has to sell their G20 model chambered in the respected 10mm auto cartridge, the most powerful of all common semiautomatic cartridges. With more than a quarter of a century of experience, Glock is offering the large-frame 10mm Glock 20 with a 4.6-inch barrel as the ideal field pistol that hunters will appreciate in both a sidearm and a primary gun role. The Glock 20 with prefix SF (Short Frame) is the 4th Generation featuring a short frame size to accommodate most hands, making it somewhat better than the old large frame G20 version. Additionally, the Glock 20SF comes with two larger back straps and two beavertail extensions that spread the recoil of the powerful 10mm auto round across a larger area of the shooting hand. Furthermore, the Glock's polymer frame absorbs recoil, keeping the pistol controllable and highly accurate in the hands of professionals who are used to it. 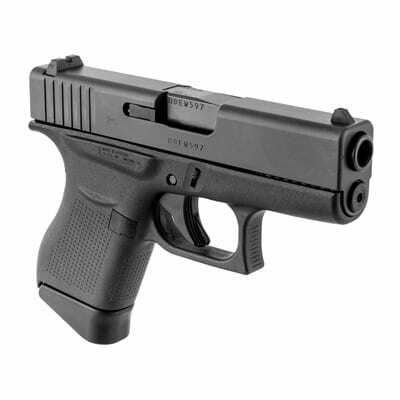 This Glock`s powerhouse, chambered for the potent 10mm auto cartridge, generates 550 ft. lbs. of muzzle energy, which is similar to the full power of the .357 Magnum. However, most shooters claim the subjective recoil of the G20 is well below the level of standard of the .357 Magnum revolver cartridge. As one of the most powerful Glocks, the G20 SF in 10mm auto with a 15-round magazine is perfect for bear protection, hog elimination, and range time. Having a more comfortable short frame, the SF version offers enhanced controllability and practical accuracy with an improved trigger position and maximum sight radius. After the triumphant debut and astonishing success of Glock full-size service sidearms in the military and LE organizations, Glock has turned towards home defense and the civilian market, both more oriented to the smaller, concealed carry weapons. A logical follow-up, Glock has developed the subcompact family of guns, often called the “Baby Glock" series. Until the introduction of the Glock 26 in 1994, the concealed carry and back-up niche was dominated almost exclusively by five-round, snub nose revolvers. While similar in dimensions to the small frame .38 snub nose revolvers, the Glock 26 was chambered in the powerful 9mm Parabellum cartridge with 10+1 capacity. Aside from the standard double-stack magazine with ten rounds, this Baby Glock can use the Glock 17`s seventeen-round magazine, or G19`s 15-round nine-millimeter mag, or even 33-rounders intended for selective-fire Glock 18. However, this tiny pistol is primarily optimized for concealed carry and then to be an outstanding secondary defensive gun. Whereas this Glock subcompact is an excellent compromise between concealability and performance, measuring 4.17 inches in height and 1.18 inches in width, it is not the best solution for deep concealment. As the real downside, some individuals complain that grip is a little too short and not very ergonomic, requiring you to reset your grip after each shot. Currently, the Glock 26 (G26) sub-compact handgun is available in 3rd, 4th, and 5th Generation models, but our model PG2650201 is the Gen 4 Glock 26. The characteristic features are a modular backstrap design for a better hold, the new Gen4 rough grip pattern, a reversible enlarged magazine catch, and a new Glock dual recoil spring assembly. Regardless of everything, the Glock 26 is a concealable pistol, sufficiently powerful and "shootable" for those who want one handgun for both concealment and defensive uses. While the Glock 43 is a very popular small pistol, like the Glock 26, especially among those who like to carry their handgun concealed, the G43 is really specialized for concealed carry in deep concealment situations. After the G42, the Glock's smallest pistol chambered for .380 auto, Glock released in March 2015, a single-stack Glock 43 (G43) slimline, 9mm, Luger handgun designed as a comfortable and acceptably powerful, everyday carry gun. As a full-blooded member of the subcompact category, the Glock 43 is just 6.26 inches long, 4.25 inches high, with only 1.02” width. All of these measures combined with the weight of loaded gun at just 22.36 ounces make the Glock 43 particularly easy to conceal on one’s person. Though the capacity of six 9mm bullets is sufficient for an ultra-concealable gun, due to large magazine catch, you should be able to quickly and easily change magazines and compensate for the pistol`s low ammo capacity. Since the G43 is a highly specialized model, it is neither ideal as a defensive gun option nor as a competition gun. Such a small gun is not fun to shoot or bring back on target up for follow-up shots. Clearly, it is for shooters who need concealability above all else, but not for beginners, because its small dimensions require a solid shooting technique and proper skilled grip to manage the recoil. Glock pistols are favorites of both police departments and civilian shooters in the USA and all over the world. While there are alternatives, Glock brand handguns have been proven through duty and torture testing unlike any other guns out there, offering gun owners a tremendous bang for the buck. Since the Glocks are simple, durable, reliable, and accurate pistols, most people who are just entering the fantastic world of handguns begin their journey with legendary polymer framed pistols. As with any other popular and widespread consumer products, the Glock family of pistols are the theme and topics of endless discussions and debates. The shooting community widely accepts the new polymer frame handgun but there are further questions often asked by first-time buyers before buying their first Glock. What Does the SF Stand For on Glock? The suffix "SF" does not stand for "slim frame but for the "Short Frame" models that Glock introduced in 2007. The SF designation comes on some of standard frame Gen3 pistols to indicate that they have a reduced circumference receiver in the backstrap area. Usually, it means that the trigger reach distance of the SF grip is shorter by 2-3mm measured from back strap to trigger, making the larger 45 guns easier to hold. Which is Bigger, the Glock 17 or 19? Despite popular misconceptions, like the G17 got the name by its 17 round magazine capacity or similar, not many of them are true. Simply, the Gaston Glock’s handgun was the 17th patent procured by the company and first model that came in mass production. The main reason for G19 development was that Glock 17 was designed as a full-sized handgun for military service, sporting the 4.48’’ barrel and measuring at 25.06 ounces. Since it was a bit large for many gun enthusiasts and civilian concealed-carry wearers, Glock soon reacted by releasing their compact offering called Glock 19 into the market. It boasts a slightly decreased ammunition capacity to a 15 round magazine and a 4-inch barrel. 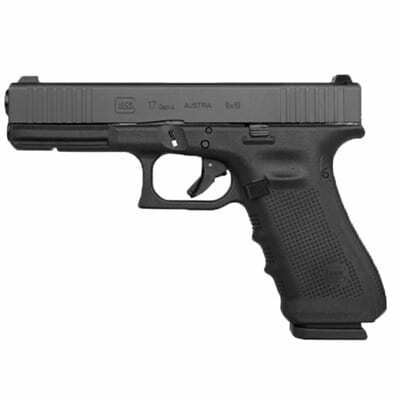 In overall length, the G19 is approximately half an inch shorter than the G17 and weighs 23.65 ounces. Although it is only a bit smaller than the standard G17 pistols, the Glock 19 is an ultimate all-rounder, suitable as a back-up, for concealed carry, or as a home-defense weapon. Do Glocks Have a Safety? If you expect to see the traditional style of external safety in the form of some kind of lever or switch, then you will be disappointed, because the Glock pistols don't come with an external safety to flick to the on/off position. 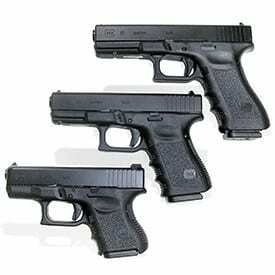 In fact, Glock handguns use three safety mechanisms: trigger safety, firing pin safety, and drop safety. The only visible part of a Glock’s` safety is a tab in front of the trigger, which prevents negligent discharges because the trigger must be pulled in a certain way for the pistol to fire. Are Glocks Made in the USA? Actually, all Glock handguns are manufactured in both the United States, as well as, Austria, except for the .380 auto caliber G42 Glock model, which is produced in the US due to ATF import regulations. The Glock USA factory, placed in Smyrna, GA uses the American made frame, slide, and barrel, while the rest of the components come from Austria. What Glock Do Law Enforcement Agencies Use? The standard issue weapon for police departments and other law enforcement agencies may vary, but overall, the Glock holds almost 65 percent of the police market in the U.S. The most common Glock models are the Glock 17 and its fifth generation called the 17M, followed by the Glock 19 in 9mm, while plainclothes agents may carry the smaller Glock 26 in 9mm. Other police agencies also use the Glock 22, G23, and G35 in .40 S&W and some law enforcement officers carry the Glock 21 or 21SF in .45 ACP, as well as the Glock 31, Glock 32, or Glock 33, all chambered in .357 SIG. How to Tell What Model Glock You Have? The first, quickest, and simplest answer to differentiate Glock models is by caliber and size. Over time, the Glock has updated their handguns throughout the five generations, and while you may encounter any of them, the most common that you'll find out there are Glock Gen 3, Gen 4, and Gen 5. Here are some identifying features to help you figure out which Glock model you have. The 1st Generation has the smooth, rounded “pebble-grip”. The 2nd Generation has the "Grenade-style" checkering with NO finger grooves. The 4th generation Glock has changeable back straps, an enlarged and reversible magazine catch, a dual recoil spring, and a rough textured frame. The Gen5 pistols offer the option of the MOS system, ambidextrous slide stop levers, a new barrel, and magazines, whereas they lack finger grooves on the grip. 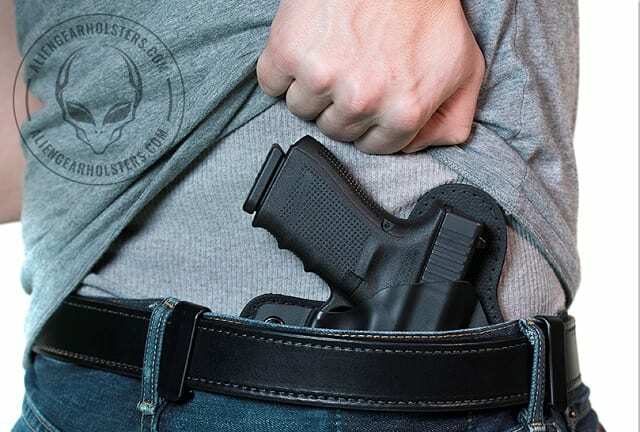 2019 Review – Best Glocks for Home Defense – Stay Safe!